Go to another folder on your long detailed folder list by clicking Ctrl+Y. Use the arrow keys to expand folders that have subfolders. 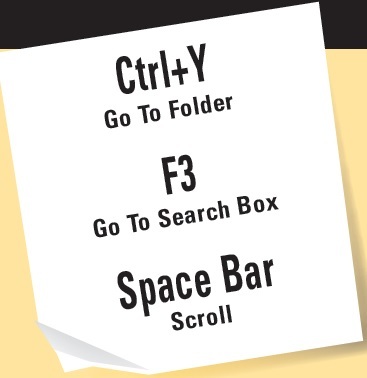 Reveal the Search Tools contextual tab and place your cursor into the Search box with F3. Press Alt to reveal the shortcut keys in the Search tab. Use the space bar for scrollbar-free scrolling down a long message in the Reading Pane. Use Tab and Shift+Tab to move back and forth between the panes.